From Christchurch to The Hague | GirlGuiding New Zealand - You be the guide! Getting to travel to the other side of the world at the age of 16 was something GirlGuiding Ranger, Rachel, never imagined herself doing, but now she’s planning her next adventure. 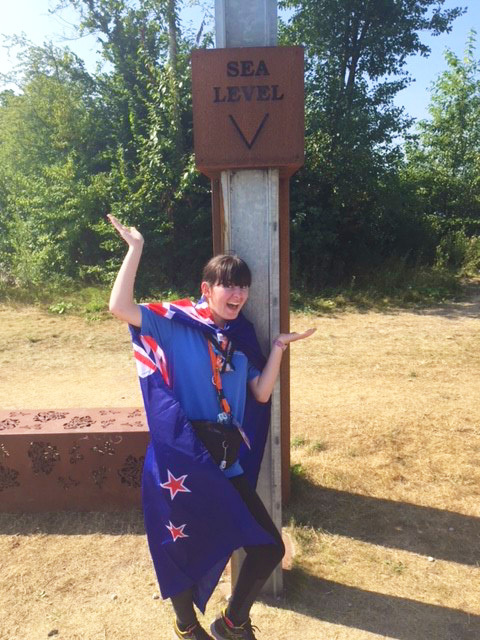 Rachel’s boost in confidence follows her experience at international event ‘Roverway‘ in The Netherlands where she took her place alongside 4,500 excited 16-22 year olds from all over the world. Roverway 2018 was organised by Scouting Nederland together the World Organisation of the Scout Movement (WOSM) and the World Association of Girl Guides and Girl Scouts (WAGGGS) from the 23 July – 2 August. Participants kicked off the event by camping on the beach in The Hague, then followed a path through Belgium, Germany and The Netherlands. At the main camp in Zeewolde, a variety of experiences were available, anything from sailing to drumming workshops. However it was the friendships that made a lasting impression on Rachel.